Hammer crusher is extensively applied in the fields of cement, chemical, electric power, metallurgy and other industrial sector, hammer crusher is mainly used for medium and fine crushing medium hardness materials, such as limestone, slag, coke, coal and other materials . 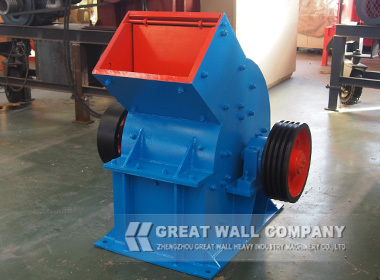 The maximum feeding size of hammer crusher is around 350mm, and the output size range from 15mm to 50mm.Hammer crusher features of low energy consumption , simple structure, light crusher weight, which is easy to operation and maintenance. While there are also some technical disadvantages of hammer crusher in stone crushing plant and sand making line. Hammer head and grate are easy to be worn , when water contenting of materials is exceed 10%, hammer crusher usually appears jam in the crushing cavity.They all lead to hammer crusher stop and expensive wear parts cost. Great Wall Company produce the new type durable crusher wearing parts for hammer crusher to prolong its service life and reduce production cost. Welcome to visit and consult us with hammer crusher. Next: What are detailed features of mobile jaw crushing plant in construction and mining industry ?